Student loan refinancing is a popular solution to student debt these days. Refinancing is a financial tool that allows recent graduates to save a significant amount of money in the long run by replacing their existing loans with a new one. The new loan often has either a better interest rate or more favorable repayment terms. Today, 19 percent of all private loans are taken out to help pay off student debt. Let’s take a look at why those recent grads, like Zina, have begun to refinance their student loans. Student loan refinancing is a financial tool that offers an opportunity to find more favorable terms on a loan. Refinancing also saves graduates money. Sometimes, a lot of money. Graduates can lower their monthly payments or even repay loans more quickly with student loan refinancing. Refinancing is a newer solution to our student debt crisis. Since the the 2008 financial crisis, many students have explored student loan refinancing to manage their financial present and future. Refinancing concerns have grown recently. The cost of college has risen at an excessive rate, so more college graduates than ever need assistance with tuition. Is that why so many millennials are opting for student debt refinancing? As of this writing, student loan debt has reached a staggering $1.5 trillion. Let’s look back to the 1987-1988 school year. The Bangles’ “Walk Like an Egyptian” topped the charts; Rain Man dominated the box office; and tuition at a public four-year university cost $3,190, adjusted for the dollar in 2017. For the 2017-2018 school year, “Havana” by Camila Cabello f. Young Thug was ringing through dorm rooms and frat parties across campuses, MoviePass let students repeatedly laugh at Jumanji: Welcome to the Jungle and costs for tuition ballooned to $9,970. That’s an increase of 213 percent! 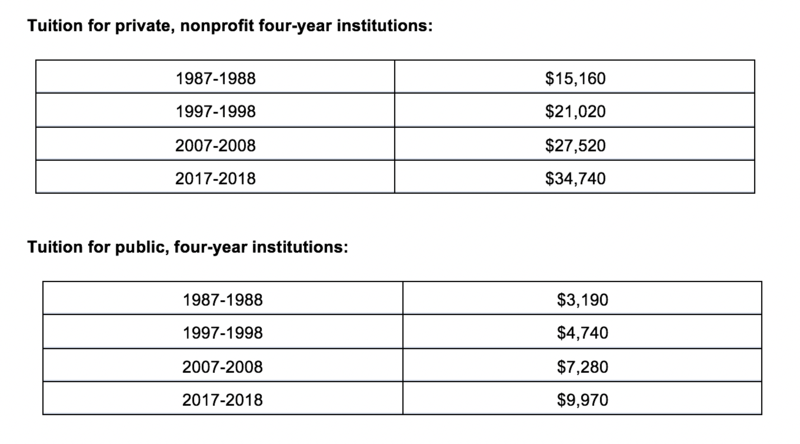 The following tables illustrate the dramatic changes that have resulted in the popularity of student loan refinancing. Let’s take a look at how you can determine, with confidence, that refinancing your student loans is the right solution for you. A proven track record of helping graduates find more favorable terms has earned larger lenders trust amongst the younger generations. Graduates can be assured that their financial information is safe and rest easy knowing they are saving money with a more manageable repayment plan. CommonBond has a record of helping college graduates successfully pay off student loans with better terms than their original loans. Student loan refinancing is an option for recent college graduates who paid for school using either private student loans or a mix of private and federal student loans. Refinancing student loans allows graduates to save thousands of dollars in interest during the life of a loan. Move out of their parents’ homes. Allow for better budgeting to manage special life events like weddings and the bachelor or bachelorette parties, wedding showers, and other fun gatherings that come along with them. Increase flexibility to accommodate changes in a living situation in the event of a rent hike, breakup, etc. Find out how much you could save by refinancing your student loans with our free student loan refinancing calculator. ‍Did we answer all your questions on why younger generations have started to refinance their student loans? Refinancing student loans can help graduates save a considerable amount of money in the long-run. Tuition costs have increased substantially in recent years, resulting in more student debt than ever. Favorable terms and high customer satisfaction rates make major lenders worthy of your trust. Live your best life with the savings you gain from refinancing student loans. So, are you ready to refinance you student loans? Refinancing can help you help you accomplish a lot. Saving money is a great head start on the home of your dreams or some world travel before your adult responsibilities blossom into a relationship, marriage, or even a family. If you feel like it’s time to consider student loan refinancing, here’s a helpful place to start.